Earlier today, President Barack Obama revealed to anyone who hadn't heard before that he was a comic book fan growing up. The President, who has been featured in comics from Spider-Man and Savage Dragon to custom titles like Barack the Barbarian (he was a Conan fan as a kid), referenced his geek background in a statement he released earlier today. "I grew up loving comic books. Back in the day, I was pretty into Conan the Barbarian and Spiderman. 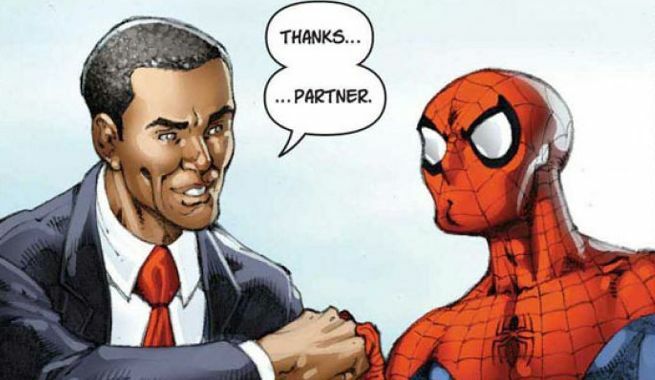 Anyone who reads comics can tell you, every main character has an origin story -- the fateful and usually unexpected sequence of events that made them who they are," Obama wrote in an e-mail encouraging activists to share their "origin stories" with a nonprofit organization. Those who submit a story about the moment that inspired them to get involved with community activism will be entered into a drawing to meet him at a ceremony in Washington, D.C.